Released: January 2019 (The last days of the month). Recorded: Live at Knebworth Park, Stevenage, UK 9th August 1986, + Wembley Stadium 11th July 1986 + Budapest 27th July 1986. Sound: Well, I not sure right now. Back as soon I know more. Comments: As far as I have found out, this is the officially live album, which was edited heavily to fit as much songs on one album. On this bootleg, I've understand some edited songs are completed with songs from the officially live records. I'm not sure all edited songs are completed. I think just the Wembley & Budapest songs are fixed. Info say's 14 minutte longer than officially album. A DVDR with a amateur video film of the large screen (over the stage), are added separately with some stickers cd's. Official work "LIVE MAGIC" which was a phantom work of the century. A live album that should be said to be a complete version is on permanent storage press CD. 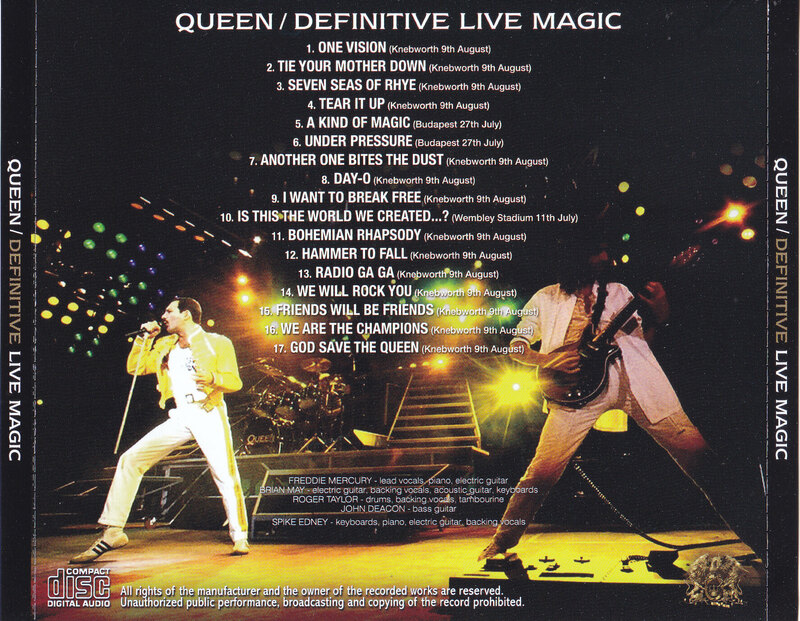 In QUEEN history ...... No, there may not have been a controversial live album as "LIVE MAGIC" in rock history. 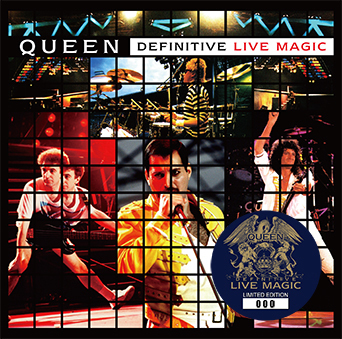 The official live album of "MAGIC TOUR" that QUEEN who played the revival at that LIVE AID pulled the performance work "A KIND OF MAGIC". Originally, it was natural that it was acclaimed all over the world, but to insert it into one LP, it is extraordinary live board which assembled Muriyari with excessive editing. From "Bohemian Rhapsody", the opera part is removed and "Tie Your Mother Down" is a 2nd verse and chorus. "Is this the World We Created ...? ", "I Want to Break Free", "We Will Rock You", "We Are the Champion" ... ... as if it were an "edit for single" It was included in the version. That gorgeous style (as a matter of course) is highly unpopular from fans. It is not only the black history of QUEEN, but also elected from the mother country's British music magazine 'Q' to 'Five most challenging albums that a great band got.' It has been accredited as a poor work on lock history. However, if it was bad to the live itself, it was not regarded as a problem so far. The part that is contained was too great. 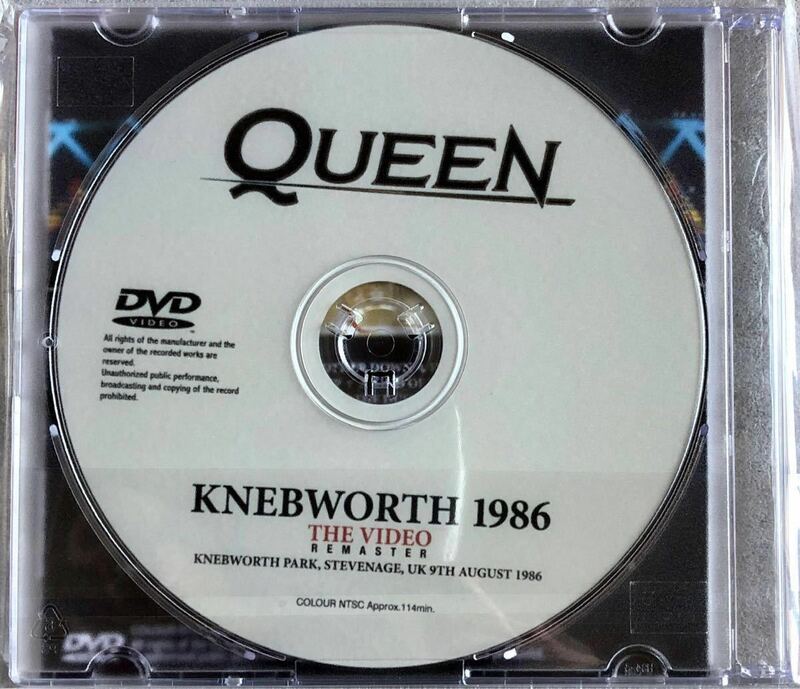 Especially the main thing is QUEEN's final show, that "August 9, 1986 Nebworth show". While turning the multi to the most important concert ... ... Because that feeling is so intense, I felt disappointed worldwide. Of course, it is now out of print, and even now the movie "Bohemian Rhapsody" is making a big storm, it is not even the case for a recurrence. This album is a live album that clears up frustration for 33 years. It was produced by overseas core mania, complemented by making full use of the existing same day recording. It is a live album that embodies "original LIVE MAGIC". This master was not disclosed to the net, it was only "a secret enjoyment between the core mania," which only the knowing person knew. I gave it for this work. About 14 minutes longer than the official board "LIVE MAGIC should be original". It is a super entertainment album that clears up the regret that I felt 33 years ago and becomes "reality" at a stretch "This is what I wanted to hear". Of course, it goes without saying that the show itself of QUEEN itself is wonderful, but it is a piece that is impressed even while smiling at the deep mania heart that realized it. Please enjoy yourselves carefully with a permanent preservation press CD. ★ Corrected the missing edited portion more than the sound source of the day.